Albert’s Private Members’ Club announces the much-anticipated re-opening in the heart of Chelsea. The relocation to Beaufort House this October will see Albert’s deliver a bigger and better return as the concept is re-imagined within our four-story townhouse on Chelsea’s Kings Road. Albert’s, for the first time will also offer an all day and night experience for members. Discover the new iteration of Albert’s, as it extends over the upper three floors to encapsulate an all-day restaurant, two bars and a nightclub plus private dining room that can be used for lunches, dinners, events and meetings. Offering far more than the Kensington location and three times as big, new and existing members will be introduced to an upgraded venue that speaks to the heritage of the brand while propelling it firmly into the future. Albert’s distinctive atmosphere of quintessential English charm merged with lively inflections of Italian passion are present in the townhouse, flooded with natural light, as a relaxed sophistication permeates the venue by day to become electric as dusk falls. The redesign, led by Olivia Alexandra Interior Design, incorporates geometric patterns that play against warm prints and heavy velvets. Inviting brass tones act to lighten the rich, signature Albert’s design details of vibrant wallpapers and sumptuous flourishes for an effortless day to night transition. Monochromatic details and bold Art Deco finishings are the backdrop to the familiar faces and a new exciting Modern European menu plus keeping some of Albert’s favourites, which created Albert’s icons such as the steak tartare made tableside and Crepe Suzettes. As traditions are honoured yet simultaneously reinvented, this exciting new twist on the Albert’s brand will offer an elevated experience for members, designed to surprise and delight all. 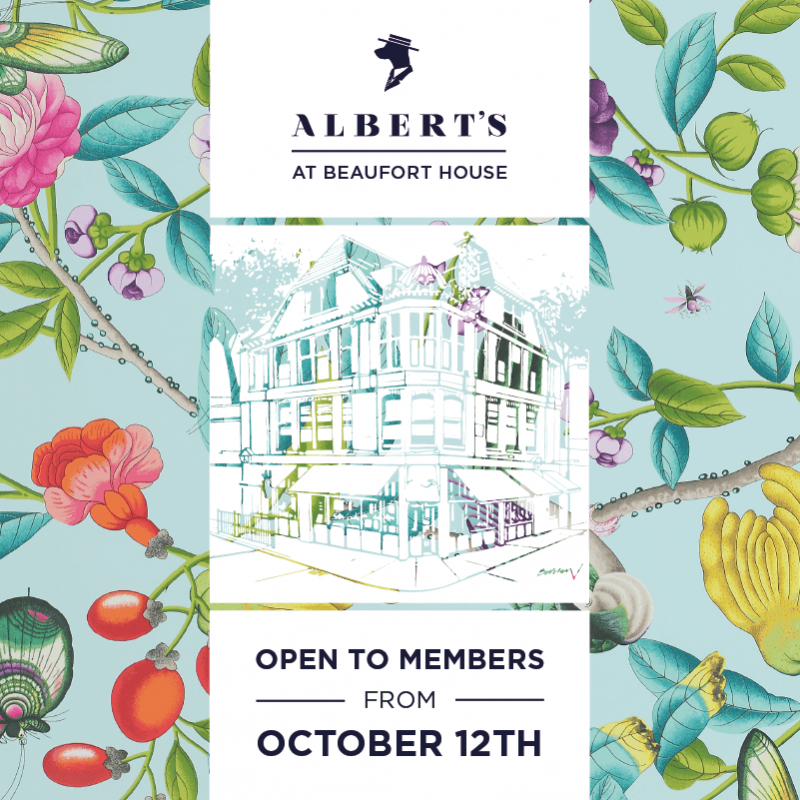 Albert’s at Beaufort House will be open to members from Friday 12th October 2018. We look forward to introducing you to Albert’s at Beaufort House.